Schlenherla is located in Bamberg, Germany. The Schlenherla tavern is mentioned in scarce from 1405 to 1615. The building was destroyed in the 30 year war (1618-1648). The brewery with name as it is known today can be dated back to 1678. Through the years various owners was in possession of the brewery and today it is in the hands of the Graser family. I bought this beer in a local beer shop in Berlin, Germany at the price of 2,75 Euro for a 500 ml bottle at 5,2%. The colour is brown and it is unfiltered. The head is relatively small and disappears fast. The aroma comes off with the smoke and a hint of fruit. The smoked malt really dominates the taste, smoke is dominating the fruit and the after taste is a gentle smoke too, the CO2 is good. This beer really reminds me of sitting in a pub, having some beers and smoked sausages on the side, a real pleasant memory and this beer got me real hungry. 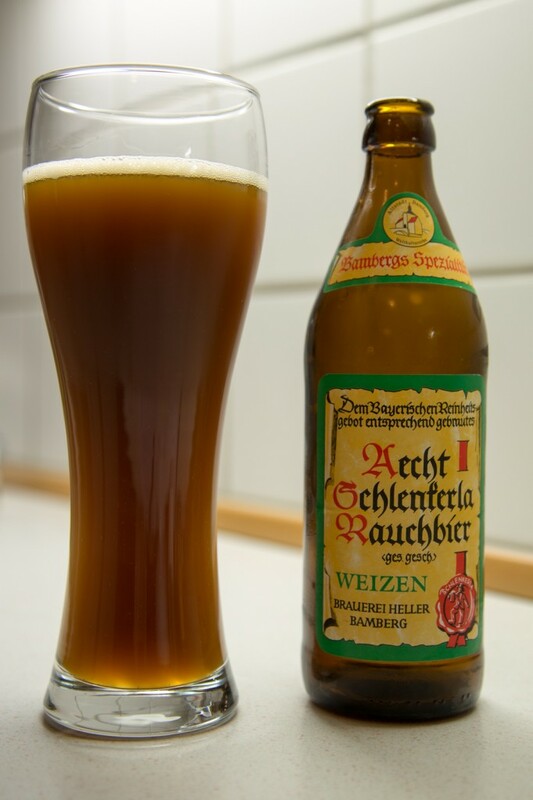 This entry was posted in Beer and tagged beer, smoke, weissbier. Bookmark the permalink.